The expanding remains of a supernova explosion in the Milky Way are shown in this composite image, on the left, of the supernova remnant G1.9+0.3. NASA's Chandra X-ray Observatory image obtained in early 2007 is shown in orange and the radio image from NRAO's Very Large Array (VLA) from 1985 is in blue. The difference in size between the two images gives clear evidence for expansion, allowing the time since the original supernova explosion (about 140 years) to be estimated. This makes the original explosion the most recent supernova in the Galaxy, as measured in Earth's time-frame (referring to when events are observable at Earth). Equivalently, this is the youngest known supernova remnant in the Galaxy (140 years old), easily beating the previous record of about 330 years for Cassiopeia A. The rapid expansion and young age for G1.9+0.3 was recently confirmed by a new VLA image obtained in early 2008. The original supernova explosion was not seen in optical light about 140 years ago because it occurred close to the center of the Galaxy, and is embedded in a dense field of gas and dust. This made the supernova about a trillion times fainter, in optical light, than if it had been unobscured. However, X-rays and radio waves from the resulting supernova remnant easily penetrate this dust and gas. On the right is an infrared image from the Two Micron All Sky survey (2MASS), where the colors represent different infrared wavelengths. 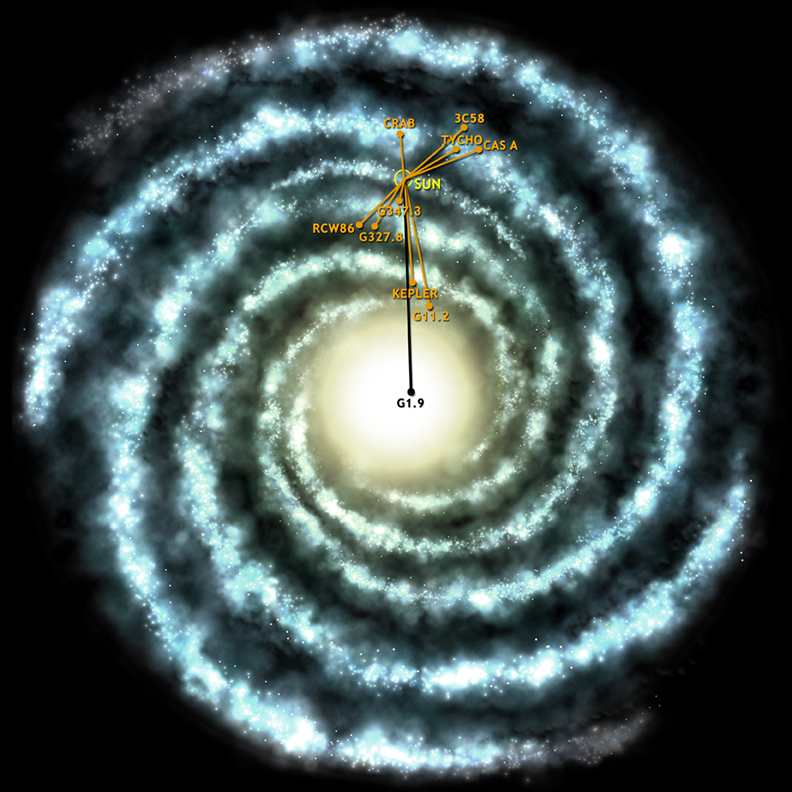 The center of the galaxy is the bright red spot in the upper right and the location of G1.9+0.3 is shown by the box in the lower left, less than two degrees away (corresponding to about a thousand light years at the distance of the galactic center). More stars are visible in this 2MASS image than in an optical image, where obscuration by dust and gas is more prominent. Also, note the difference in orientation: in the close-up view of G1.9+0.3, north is up and east is to the left, while in the 2MASS image north is to the left and east is down. Supernova remnants are caused when the debris thrown outwards by the explosion crashes into surrounding material, generating a shell of hot gas and high-energy particles that glows brightly in X-rays, radio waves and other wavelengths for thousands of years. In the case of G1.9+0.3 the material is expanding outwards at almost 35 million miles per hour, or about 5% the speed of light, an unprecedented expansion speed for a supernova remnant. Another superlative for G1.9+0.3 is that it has generated the most energetic electrons ever seen in a supernova remnant. Scale Left panel is 5 arcmin across. Coordinates (J2000) RA 17h 48m 45s | Dec -27° 10´ 00"